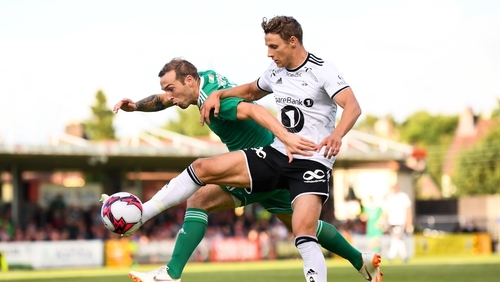 Cork City manager John Caulfield was left to bemoan the "very soft goal" that opened the scoring for Rosenborg against his side in their Europa League qualifying first-leg clash at Turner's Cross last night. The Rebels lost 2-0 on the night as a first-half brace from Jonathan Levi was enough to see Rosenborg take a commanding lead into the second leg in Trondheim next week. However, City were the better team up until the Norwegian side took the lead against the run of play in the 25th minute. Swedish under-21 international Levi skipped past Shane Griffin inside the box and drilled a fierce strike under the feet of Mark McNulty at his near post. Levi claimed a second just before half-time, but for Caulfield that opening goal was the turning point and left his side with a mountain to climb in the second leg. Speaking to RTÉ Sport, he said: "We did what we said we’d do, we’d get at them and we’d tear into the match and the first 25 minutes were excellent. "We had a few half-chances and put them under a lot of pressure and you could see they were uneasy, but in their first attack they scored a very, very soft goal from our point of view. "When he [Levi] went down the line, I’m not sure whether he went to cross it or shoot it, but it ended up in the back of the net through Mark McNulty’s legs and it was soul-destroying after doing so well. "The game was even enough and then they score with more or less their second attack just on the stroke of half-time, so it was very difficult." Caulfield was proud of the effort shown by his side on the night but admitted that it this level, his side need to be more clinical in front of goal. "But I said to the lads, in the second half they gave everything and they were honest and that’s what they have to do. "You look at the way our league is and you go to Europe and people have high hopes but you come up against teams that are at a different level, slightly better than you and when you have an opportunity to score you need to take it. "If you don’t, then they’re great on the counter-attack."